The pomelo is a large citrus fruit native to southeastern Asia. Usually the size of a grapefruit, it is known to grow as large as a watermelon. This exotic fruit has a thick green-yellow rind and pale pink flesh. Its flavor ranges from sour to sweet also much like a grapefruit. The pomelo is a low calorie, high nutrient fruit. An excellent source of Vitamins A and C, it is a natural antioxidant. Minerals such as calcium, magnesium and potassium are also abundant in this fruit. It is a good source of fiber. 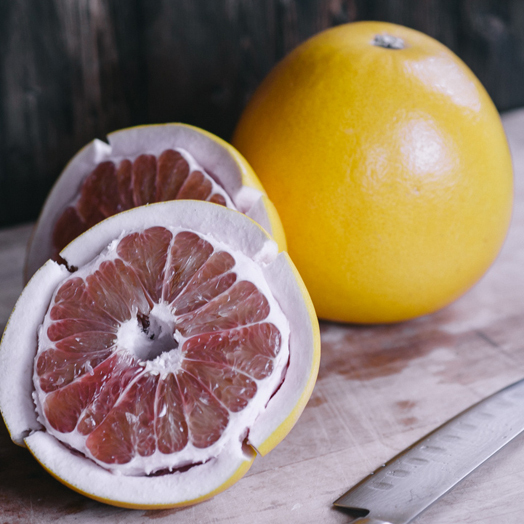 Pomelos should be used quickly after delivery as they are perishable. Keep them and other citrus fruits in the refrigerator until you are ready to use them. To maximize the flavor, set the fruit out on the counter a few minutes before eating to allow it to come to room temperature.